Zee Kannada set to bring alive a spellbinding musical journey with Arjun Janya this weekend! 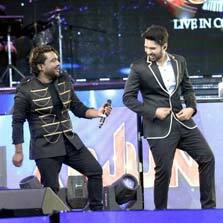 Zee Kannada recently brought together the musical prowess of ace musician Arjun Janya along with Armaan Malik, Vijay Prakash, Anuradha Bhat and Indu Nagaraj for a spellbinding musical evening at the Silent Shores Resort in Mysore earlier this month. The event saw over 2000 music enthusiasts attend the live concert and regale in soulful melodies. Celebrating the mesmerizing power of music, Zee Kannada is set to telecast this musical extravaganza on June 30 and July 1, 9.00 PM onwards, that viewers can enjoy at the comfort of their homes. Known for his extraordinary music, the concert saw Arjun Janya perform some of his high-octane songs. The highlight of the evening was an energized 'Jugal-Bandi' between Vijay Prakash and Arjun Janya that received a thunderous applause and appreciation from the fans. With childhood superstar from the Zee Kutumba, Zee TV's Sa Re Ga Ma Pa finalist and playback singer Armaan Malik taking the stage in Karnataka for the very first time, took the entertainment quotient several notches higher. Fans were floored as he began singing his award-winning song, Ondu Malebillu from the movie Chakravarty. AJ Live in concert will be telecasted this Weekend at 9pm.